While he and his wife were strolling one hot summer evening a few years ago, Leonard Schwartz, the Pittsburg psychiatrist who invented Heavyhands, spied a runner with the hand weights. But instead of pumping the weights up and down as he ran, the young man was merely carrying them. “I ran after him for four blocks in Manhattan, yelling in the 90-degree heat,” Schwartz recalled. This story comes pouring out in his stream-of-consciousness way, and it neatly illustrates the intensity of the obsessions that has come to drive Schwartz’s life: combined exercise. Use as many muscle groups as possible during a workout to achieve maximum oxygen consumption by the muscle cells. The trendy little weights cushioned with red foam rubber used to accomplish this are incidental. Schwartz doesn’t disagree that you could be grasping two jars of mayonnaise. Or two bags of bird shot. Or two stones. It’s the weight and the movement of the arms in concert with the rest of the body that is everything. Schwartz is so certain of the purity of his vision that he believes he could alter forever the world of fitness if those who are blind and deaf to his idea would but only open their eyes and listen. To this end, he has closed his psychoanalytic practice in Pittsburgh and devotes himself full time to exercise physiology. Using the fortune he has amassed from Heavyhands and sales of his two books about their use, he has equipped a physiology laboratory at the University of Pittsburgh, where he holds the title of adjunct professor of physical education and health. In the laboratory he has installed tom Auble, a former engineer who became a Heavyhands convert, switched over to exercise physiology and is completing work on a doctorate at the university. Auble’s master’s thesis completed two years ago was titled: Cardiorespiratory Adaptations to Heavyhands Exercise Training. Subsequent papers and research projects by Auble on exercise with hand weights have substantiated Schwartz’s beliefs about combined exercise. There has been a lack of recognition, a downright skepticism, from the exercise physiology establishment about the use of hand weights and combined exercise. “We have had a deuce of a time getting the academic community to pay attention to our research, even after it’s been properly referenced and published,” Schwartz wrote in a recent letter to an interested party. But some of Auble’s latest research using fit experimental subjects has found an astonishing increase of 500 percent in workload when the workout involved hand weights according to the Schwartz method. The key is pumping the weights. The more the arms move them and, particularly, the higher they are rhythmically lifted, the greater the workout. If Auble’s findings are accurate, it would mean that for the same amount of time spent in a typical workout involving running or a similar activity, vastly greater aerobic benefit could be had from a Schwartz workout. Schwartz is committed to spreading the word. He has coined the term “panaerobic” to describe aerobic workouts in which all the body’s muscles are systematically called upon. He created a video, “Heavyhands Panaerobics Basics,” starring himself, Auble and another colleague, Judy Shasek. And he has formed his own book publishing company, Panaerobic Press. He has formed the Leonard and Millie Schwartz Foundation (Millie is his wife of 42 years) to fund research into combined exercise. Presumably, research intended to illustrate further the benefits of combined exercise will meet the warmest reception. Schwartz is the first to admit such activity might sound like just another fitness mania entrepreneur cashing in while his products are still hot. He does not reveal how much he has made from Heavyhands and the books. But more than 2 million of the weights have been sold for about $20 a set, and he owns the patent. His first book sold about 400,000 copies in hardback and paperback. “Exercise should involve all of our musculature,” Schwartz continued. 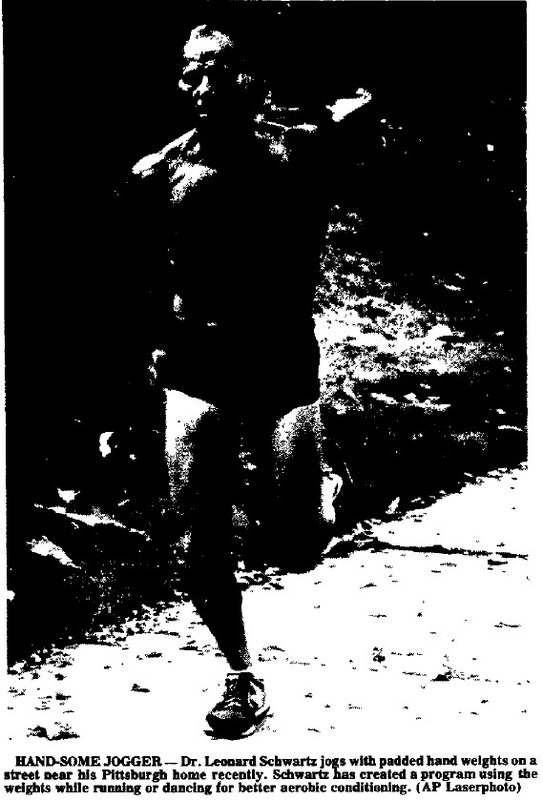 Schwartz began running and then using hand weights in his early 50s because of the fear of death and a narcissistic desire to improve his body. Now 63, his body is muscular and sculpted. There’s more to today’s jogger than running shorts and shoes. Heavyhands, Lace Weights, weight vests and pulse meters are likely to accompany exercises as they tone and moan, and retailers report swift sales of these accessories. Heavyhands is the “real craze” at Eby’s Sporting Goods, Westdale Mall, according to store manager Holly Netolicky. The idea behind the red foam-covered solid steel rod and aluminum handle is to tone the upper torso while exercising the legs. Weights from 1 to 5 pounds can be attached, and Eby’s most popular seller is the 3-pound weight, according to Netolicky. The suggested price for Heavyhands is $19.99, which includes 1 pound weights. Additional weights are sold separately and range from $7.99 for 2 pounds to $19.99 for 5 pounds. Triangle Bands, a member of the Heavyhands family, are popular at Sporty Lade, Lindale mall, according to store co-owner Lisa Miller. The flexible foam-padded and Velcro-covered band is $13.95 per paid, and fits either write or ankle. 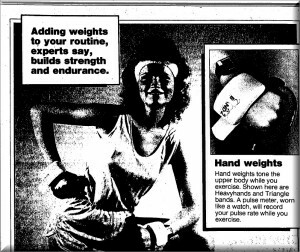 Weights range from 1.1 to 3.5 pounds with bands in two sizes to accommodate exercisers with small measurements, Miller notes. She says the lowest weight is the biggest seller. “Even 1 pound of weight gives a lot more stress. 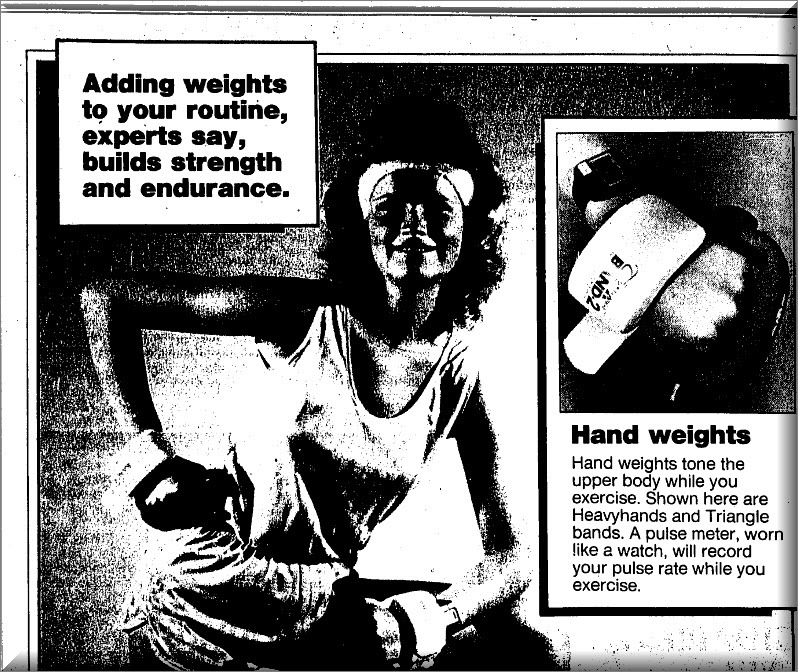 The weight glove, available at Five Seasons Sporting Goods, 3300 Johnson Ave. NW, is particularly appealing to female joggers, according to manager Steve Miller. Because weights are built into the back and palm of the glove, runners need not grip an attached weight. “Women buy more of these because they’re more comfortable than Heavyhands,” says Miller. He quotes weight gloves at $15.50. Although upper torso weights can be used for any aerobic exercise, sources note most sales are to joggers. “Because running is a very specific exercise, most runners will use weights to build up arm and shoulder strength,” says Lisa Miller. Arm Weights are harmless for most joggers, according to Dr. Fred Pilcher, a member of the Linn County Orthopedics and Rheumatology group. He’s also director of the Linn County Sports Injury Clinic. The added stress, however, he says, could cause trouble if the exercises already suffers back and shoulder muscle problems. Two and 3-pound dumbbells are an important part of Mercy Wellness exercise programs, according to director Dagmar Munn. Participants use the weights during aerobic walking and dance routines. “They know they’re really working their muscles,” says Munn. Described by Munn as an “adamant weight user,” Lynn Kieler, a nurse at Mercy Hospital, routinely adds two to three pounds to her thrice weekly aerobic workouts. “I’d been taking aerobic classes for about two years and my weight was good, but I wanted to be firmer,” says Kieler. Ankle and Foot weights also challenge the stamina of exercise buffs. Choices include Velcro-covered wrap-arounds, or lace weights which lace right through the shoe on both sides. Lace weights come with eight small “bags” which can be added on and cost $19.99, according to Neolicky. Ankle weights are priced between $14.99 and $16.99. These weights are used mostly by football and basketball players to build leg muscles, according to Pilcher. He does not recommend ankle weights for general conditioning or jogging. Weight vests, or bands are a challenge even to fitness “heavy-hitters,” according to Steve Miller. The vest has 36 pockets, front and back, each capable of holding a one-and-three-eighths pound steel weight. So Why Add weights to the already grueling routing of aerobic exercise? “By using a 2- to 4-pound ankle weight,” says Munn, “you’re adding 2 to 4 pounds to your body weight and causing more resistance and causing your heart rate to increase. You’re helping increase your endurance. “The added weight means you work less time and get the same benefits,” adds Netolicky. Exercises also can detect when weights would be beneficial. “In running or aerobic exercise, if you find you’re not working as hard as you used to when you first started, weights can really help,” says Lisa Miller. In case you want to hear what your body has to say about all this added stress and weight, a pulse meter is on the market. The unit is easily slipped into a pocket and records your pulse rate as you are exercising, according to Don Stepanek, assistant manager of Northtowne Schwinn Cyclery Ltd,. 1150 Blairs Ferry Road NE. It costs $89.95. “We sell them mostly to people who have had heart problems, or who have started exercising on a doctor’s advice,” he says. When it comes to physical fitness are you a model of mediocrity? That was the case with 59-year-old Dr. Leonard Schwartz five years ago. His work as a doctor gave him little time for exercise – his only workout, making rounds. Add 15 years of heavy smoking, 20 of high blood pressure and chronic back problems. That’s because “Heavyhands” changed his life, Dr. Schwartz told me in a recent interview. Heavyhands are weights – but very special ones – that maximize the benefits of aerobic exercising. They’re cushioned for comfort. They also feature straps so that if your hands are stiff or lack a strong grasp, as mine do, you can use them with ease. You slip into Heavyhands much as you slip on a glove – the strap is positioned behind the knuckles so that the rounded shaft fits comfortably into the palm of your hand. At each end of the shaft, you can insert weights, ranging from one up to 10-pounders. What Heavyhands provide, says Dr. Schwartz is an extra dimension to exercise. They bring strength plus endurance to muscles. He recommends them to be used, after an evaluation program by your doctor, if you have a physical handicap, hypertension or cardio-circulatory or orthopedic problems. The key to the exercise program Dr. Schwartz has evolved with these weights, which are lighter than conventional dumbbells lies in combined arm, leg and trunk movement. “The weights put special emphasis on neglected muscles of the upper torso and works these muscles in combination with leg exercises,” he explained. Heavyhands aren’t just for those who follow a set program of exercises, Dr. Schwartz stressed. They’re great for walkers too. Once walkers are well-trained in using the weights, the added upper extremity work they provide enhances the benefits of walking and makes arms equal partners with legs. One of the most appealing aspects of these weights is that they make exercise fun and what’s fun is enjoyable. They keep beginning exercisers from losing interest in working out and that’s a key to success. They also keep exercise from seeming exhaustingly strenuous. “The principle is simple. When the exertion is shared by more muscles, the exerciser is actually working harder but without feeling he is working harder. I’ve tried some of the easy exercises in the “Heavyhands” book (check it out at your local bookshop or library). They’re great. I’ve also taken my weights walking and climbing stairs. Anything that adds zest to exercise and maximizes its benefits, as these weights do, is worth a look. Try them. I think you’ll like them. Pittsburgh (AP) – Psychoanalyst Leonard Schwartz beckons his patients to come in and sit down, then to get up with weights and run around – therapy he prescribes to build the body and massage the mind. By clutching small barbells as they run, his patients strengthen their arms as well as their legs and develop better self-images. “I see not only parallels between mind and body, I consider mind and body one,” said Schwartz, 57, who claims his new exercise program, “Heavyhands,” makes followers look and feel better. Until he was 49, Schwartz avoided strenuous exercise. He carried 147 pounds on his 5-foot-7 frame, suffered from high blood pressure and smoked several packs of cigarettes a day. One day he decided his body needed help. 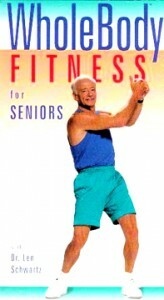 Schwartz discovered the secret was to clutch small weights in each hand while he ran, danced or simply touched his toes. To further develop his upper torso, Schwartz began modifying the exercise, swinging his weighted hands higher and higher, again and again. “I need a comprehensive exercise…I wanted a form of exercise that incorporated more of the fitness factors than any other system did,” he said. After a few years of almost daily workouts, Schwartz’ weight dropped to a muscular 132 pounds. His resting pulse rate shrunk from 80 to 38 a minute, and his oxygen-consumption rate more than doubled. Every part of this body improved, something no other aerobic exercise ever accomplished, Schwartz said. “ ‘Heavyhands’ is an endurance dominated, or aerobic exercise like all the others. But it’s a combined form of exercise – the simultaneous use of four limbs and the trunk. There’s a terrific emphasis on the upper extremities, which have been neglected historically, even in swimming,” he said. Better than jogging, dancing, cross-country skiing, and swimming? More calories are lost, as less effort is exerted, according to Schwartz. And anyone who is reasonably healthy – young or old – can follow the program, he said. Joggers lose about 10 to 15 calories per minute while running; that can climb to 20 calories per minute while walking and swinging their weighted hands, Schwartz said. It’s not that other forms of exercise aren’t good – they’re just not as good, according to Schwartz. Although between 75 million and 135 million Americans profess to exercise, not more than 3 percent or 4 percent of them actually are fit “in the ultimate sense,” Schwartz said. So far, Schwartz has taught his family, friends and colleagues how to exercise the “Heavyhands” way. He’s held exercise sessions at Montefiore Hospital, where he is chief of the psychiatric division, and at home for the elderly. And he’s organized a short daily run – with weights – through his neighborhood. Interest has swelled since his book on the subject, entitled “Heavyhands,” was released in May. He’s appeared on television and radio programs and has been featured in national magazines. This fall, he’s considering teaching “Heavyhands” to athletes at Iowa State University. He hopes to use profits from his book and a set of weights he’s designed – padded barbells that cling to the hand – to establish a large laboratory where he can perfect the method. Schwartz considers “Heavyhands” a lifestyle. “When I know I can run 10 or 12 flights of stairs without any difficulty at all, or if I can run 19 miles pumping a couple of 8-pound weights all the way, anything less than that seems to be substandard. “But I wasn’t always that way. Pumping Weights on the Run : New York Times. Combined Exercise. The concept is simple. “One of my problems is that I’m seen as Moneybags Schwartz,” he said. “People cannot believe that I could be interested in more than that. “Take a lot of muscle fibers and get them working a little bit. The total amount of work is much higher. The “isometric resistance” was produced by a variety of “handclasps” where one arm resists the other through pushing or pulling in varying directions. Unlike traditional isometrics or “dynamic tension”, the arm movements were incorporated into larger body movements to activate as much muscle simultaneously as possible. Body twists, knee dips, waist bends, lunges, etc where mixed with hand resistance moves. Dr. Schwartz also envisioned hand to leg resistance. One move mentioned in a patent application for this method mentions sitting on the floor in a knees up position. The hands/arms can then be used to provide resistance to the knees as they flex outward or inward working first the outer thigh muscles then the inner thigh muscles. However accomplished, the motion followed the doctor’s usual principles… of activating as many body parts simultaneously as possible and not letting the upper body be neglected during “aerobic” exercise. Using his methods, “isotonometrics” could produce aerobic effects equal to his other exercise protocols. The extended quotation below explains the concept in Dr. Schwartz’ own words as they appeared on the now defunct “panaerobics.com” website. ISOtonometrics is not just exercise for you, ISO is YOU! Most popular exercise these days involves apparatus of some kind. Others offer a linear approach to fitness; get your “aerobics” at one time, focus on “body-sculpting,” strength work, or other fitness factors at another. Sound familiar? Not with ISO! Even though ISO developed into an exercise system ideal for all you dancers, athletes, weight-loss-seekers, casual or obsessive exercisers, it began as a personal exploration. ISO evolved from exploration a system I developed in the 1980’s – Heavyhands. When I began my late-career leap into the exercise field – and the eventual development of Panaerobics and Heavyhands – I had several objectives in mind. I wanted my ‘strategy’ to be novel, simple, relatively inexpensive, utterly convenient, able to bring the exerciser all or almost all exercise can confer. Heavyhands did all that while including easy to use equipment that served as a catalyst for gaining the basic exercise benefits-and maybe a few more-simultaneously. In short, I wanted this exercise to be at once the very best and the most diverse available, acquired by dint of the most convenient, yet varied, tactics I could conjure. Heavyhands provides a unique brand of fitness. Important to me, while I was at it, was making it fun. In my first book, “Heavyhands: the Ultimate Exercise System”, a primer teaching a hand weight-assisted whole body exercise system, I simply ducked the fun issue. That’s because the physician/psychiatrist part of me was getting more excited about the varied and growing list of measurable benefits of exercise as well as the well-documented added risk that came with being sedentary. Fun was okay, even pure wonderful, maybe for many a it is motivational must. But twenty years ago, I didn’t want to leave people with the impression that the down and dirty benefits weren’t good enough to be worth the toil – even if the process wasn’t pure pleasure! A few years ago experts began suggesting that easy-does-it where it comes to exercise. Some went so far as to advise those who wanted to lose weight to work out at low levels of intensity. That advice was likely based on the fact that low intensity workouts were consist with metabolic activity that favors fat utilization. That argument never did convince me that low-intensity was the best fat-loss, weight-loss route because it avoided the speed at which calories of heat are expended! gain skill while having fun! “Isotonometrics”, then is Dr. Schwartz’ term for his method of “simultaneous” exercising of as much muscle as possible using only the resources of one’s own body without reference to equipment – even his own brainchild the “Heavyhands”!